As health policy within the United States continues to evolve with a new administration proposing new policies regarding current pharmaceutical product spending, executives responsible for managed market strategic accounts face an uncertain future for the coverage and reimbursement of vital health products and look to ensure continued funding for life-altering treatments from both public and private payers. 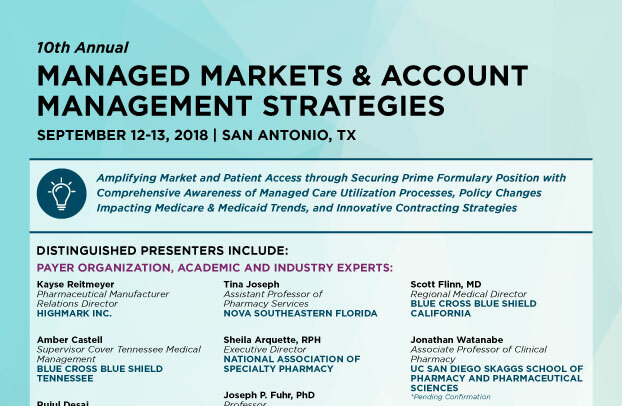 Managed care executives from the manufacturing, payer, PBM and IDN organizations will offer great insight to prior authorization, co-pay accumulators, and exclusion lists all of which have great impact on the bottom line of pharmaceutical corporations. Following payer discussions, experts will lead multiple boardroom discussion groups delving into topics ranging from change proposals to Medicare Part B and D, value-based contracting through to product review meeting optimization. Interactive discussions will enable all stakeholders from the pharmaceutical and payer communities as well as pharmacy benefit managers the opportunity for open debate and discussion to ensure mutually beneficial relationships between patients and caregivers.